Published early in 1872, MT's second major work is about going west to dig for wealth in the rocks of Nevada and ultimately finding it instead as a writer and entertainer. It was written between 1870 and the end of 1871, and based on experiences MT had had (mostly as Samuel Clemens, of course) between 1861 and 1866. In between these two sets of dates, in 1867, the transcontinental railroad was completed, an event which, MT wrote his publisher, "has turned so much attention in that direction" -- that is, to the West. As a travel narrative that keeps going west, the book was written and advertised as a companion to the eastward moving Innocents Abroad. During the long and often difficult period of writing it, MT's mood swung often between discouragement and enthusiasm. 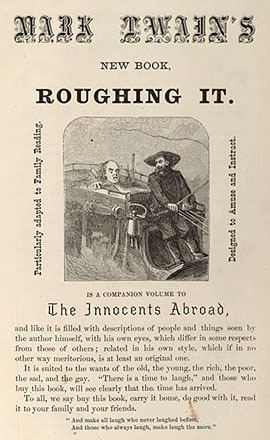 Roughing It sold well, though it was never as popular with American readers as Innocents . Its ultimate value to MT may have been to turn his imagination in directions that became, as his career went on, the sources of his greatest power -- that is, to vernacular American experience and toward his own past.